HRweb is a turnkey HRIS software solution that allows organizations to manage their workforce more effectively by allowing the staff to optimize productivity. The software helps measure and manage HR processes and ensures accountability within employee ranks. From onboarding to employee attendance and performance, the software helps automate most of the HR processes and makes it easier to track employee behavior. Suitable for a wide range of organizations of various sizes, the platform provides staff with the tools they need to manage any number of employees. The fully integrated modules, including employee information tracking, performance monitoring, attendance and behavior provide insightful information into processes and helps identify key areas where there is room for improvement. The software saves users from dealing with the pain of scattered documents and spreadsheets and offers a single platform that allows managing HR processes more easily and efficiently. HRweb is designed for modern businesses and allows access from anywhere, anytime. The software allows efficiently tracking and evaluating employee performance, behavior and other activities. The intuitive interface aims to automate and ensure better management of important HR tasks, including appraisals, performance reviews, recruitment, attendance and incident tracking. The software is available as a web-based solution and can also be hosted on organization’s own web server for more control. The employee module helps the management effectively deal with challenging HR issues by providing them with comprehensive and powerful HR capabilities, including compensation management, job history and more. All the employee data can also be effortlessly imported from CSV files or spreadsheets. The onboarding module helps businesses create a better experience for new employees by allowing users to easily assign tasks and monitor onboarding progress with a few clicks. Staff members can create professional reviews in minutes as the software makes the process of employee appraisals easier using thousands of legally-passed and pre-written sentences. The customizable and flexible performance evaluation allows organizations to invite their employees for 36-degree or self-reviews using review templates. The attendance and time tracking modules provide organizations with complete control over absenteeism and associated costs. Users can easily schedule shifts and create accrual plans that automatically calculate attendance balances. Software’s other key modules include time scheduling and tracking, employee goals and behavior management, recruitment, documentation and security. If you are interested in HRweb it might also be sensible to examine other subcategories of Best HR Software gathered in our database of SaaS software reviews. Organizations have unique wants and requirements and no software application can be ideal in such a situation. It is futile to try to find a perfect off-the-shelf software system that fulfills all your business requirements. The wise thing to do would be to adapt the solution for your specific wants, employee skill levels, finances, and other factors. For these reasons, do not hurry and pay for well-publicized popular systems. Though these may be widely used, they may not be the ideal fit for your unique wants. Do your homework, check out each short-listed platform in detail, read a few HRweb reviews, speak to the seller for explanations, and finally select the application that presents what you require. How Much Does HRweb Cost? HRweb pricing depends on the number of employees you wish to manage. Time tracking & scheduling and project tracking features cost additionally. We realize that when you make a decision to buy Performance Appraisal Software it’s important not only to see how experts evaluate it in their reviews, but also to find out if the real people and companies that buy it are actually satisfied with the product. That’s why we’ve created our behavior-based Customer Satisfaction Algorithm™ that gathers customer reviews, comments and HRweb reviews across a wide range of social media sites. The data is then presented in an easy to digest form showing how many people had positive and negative experience with HRweb. With that information at hand you should be equipped to make an informed buying decision that you won’t regret. What are HRweb pricing details? What integrations are available for HRweb? 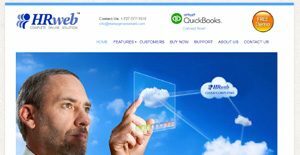 At the moment, HRweb offers a streamlined integration with QuickBooks. If you need more information about HRweb or you simply have a question let us know what you need and we’ll forward your request directly to the vendor.